Les Pins is charming 2 bedroom apartment situated on the first floor of a very well restored old Périgord style house made of natural sandstone. La Marguerite apartment is located below on the ground floor of the same house. The apartment overlooks the pool and can comfortably accommodate 4 people. Les Pins has a living room, with 1 sofa, 2 arm chairs, low table, and satellite TV, a dining room with a dining table and 4 chairs, and a small but well equipped kitchen. There are two bedrooms, of approximately equal size, and each have a French double bed (140 cm) and a bathroom with an Italian shower, wash basin, and toilet. Each bedroom has direct access to a large balcony that wraps around the entire side of the apartment. In front of the house there is a large umbrella and elegant wrought-iron garden furniture so you can relax and eat your meals in a beautiful garden setting. Kitchen: 4-burner stove, oven, fridge, coffee-maker, toaster, microwave. Living Room: Seating for 4 persons. Dining Room: Dining table with seating for 4 persons. 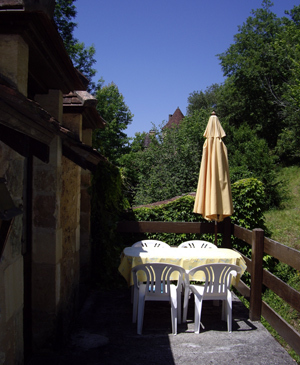 Outside: Garden, terrace, barbecue, big round table with 4 wrought-iron chairs, and parking. Pool: All guests get to enjoy a private fenced-enclosed pool (12m x 6m) with chaise lounge chairs and umbrellas. Rental Rates: For prices please click here to contact us with your desired arrival date, departure date, and cottage type. Prices vary depending on the season. Availability: Click Here to check Les Pins room availability.